To ensure the success of your construction project, you should use the correct chipboard screws for the type of material. The specific screw you need will depend on the density of the material. Wood is generally much harder than chipboard so you will need specially designed wood screws. However, some types of wood can be softer. Chipboard also goes by the names particleboard or low-density fibreboard (LDF). Since it is made of wood chips and resin, the material does not have a natural grain. Without resistance, screws are more likely to withdraw. Chipboard screws are designed specifically to prevent this. They are self-tapping, so you do not need to drill a pilot hole. The screw will cut a thread into the material itself. Chipboard screws have a thin shaft to prevent the material from splitting. Their coarse threads help to secure the screws into the chipboard. They are the best type of screw to fasten chipboard to another piece of chipboard or to fasten chipboard to wood, but they also have various applications across different industries. Primary uses for chipboard and wood screws include flooring and cabinetry. 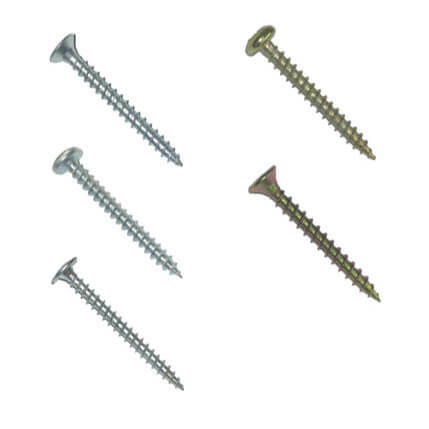 These screws are commonly used for fixing chipboard floorboards to wooden joists. Small chipboard screws are perfect for fastening hinges on chipboard cabinets. Larger screws are used to join the bigger pieces of a cabinet together. Screws of all lengths are specifically produced for use with low to high-density chipboard. Our chipboard screws range from 10mm to 240mm, with various lengths in between to choose from. These high-quality screws are available to buy with two distinct types of plating. Bright zinc or yellow passivated both have electroplating treatments to protect against corrosion. You can choose out of these colours to match the aesthetics of your project. The screws are specially hardened as well as lubricated for superior performance and ease of use. Their deep Pozi recess helps to avoid cam-out and extend the life of your Pozi bit. This is crucial to protect the screw and materials against damage. Additionally, our chipboard and wood screws include such features as a deep thread for increased grip strength and a sharp point for easy starting. They are also double-countersunk for increased head strength. This will assist with countersinking, so the head of the screw is level with the surface of your material or creates a recess, depending on the finished look you are aiming for. These screws are available with a TX star recess too if you require a Torx screw head to suit your chosen drill bit.